Ask fellow campers about "Branson Jellystone Park" and nearby attractions. We enjoyed our stay at this park nestled among the Ozark Mts. and only eleven miles from Branson. The manager was friendly, the concrete lots (several have patios) provide ample space for slide-outs and awnings, and many lots have plenty of shade. The park also has cabins for rent. We camped at Branson Jellystone Park in a Motorhome. Overall the stay was okay. In all fairness, we booked a site for Labor Day weekend two weeks prior so we knew the site probably wouldn't be the best. We stayed in the "E" section, which is down a small hill in a shaded location. I'm convinced we got the worst site in the park. The concrete pad was level but that was where the amenities ended. We were less than 6 feet from the next RV. If the seasonal people to the other side would have been in the campground, it would have been bad. Their fire ring was literally three feet from one of our slides. Trash littered the site. Not good. Other sites appeared to be okay. We were unable to extend an awning nor were we able to even eat outside using the picnic table. The slope of the site was bad. No outdoor cooking. Barely enough of a space to park. We would camp here again because the grounds were great and the hosts so friendly. Strongly recommend you call and inquire about the sites before you book. Even better, book an executive site and know you will be just fine. For reference our fifth wheel is 43 feet, so definitely a large rig. We camped at Branson Jellystone Park in a Fifth Wheel. Absolutely loved this campground. The family that runs it is absolutely amazing. My 7-year-old son and I drove there from Tennessee for a week of father-son camping. We couldn't have picked a better place. The bathrooms and showers were spotless. The showers are each in an individual room with a locking door. Yogi Bear came out, and they had crafts for the kids. The playground was perfect. You are also very close to Branson to be there in a few minutes, but far enough away to not be in the middle of traffic and noise. We will definitely be back with the entire family! We camped at Branson Jellystone Park in a Tent Trailer. In Branson, my son's favorite place was Fritz's Adventure. If you go to Silver Dollar City, make sure to go through the Marvel Cave tour. It's worth it. We made a trip to Springfield one day to go to a Springfield Cardinals baseball game. Also went to the Bass Pro Shop headquarters in Springfield. Definitely go to Lamberts, and you'll eat a ton so go on an empty stomach. Our sons are 10 and 13 years old and the boys had so much fun at the campground. We went at Halloween and the campground was full. The park had family activities going on most of the weekend. The staff are friendly and helpful. The park is small and one could easily walk to campground events. Some sites have nice swings or decks. Ours did not but I would recommend if one is available. The campground was probably a little further than I thought from Branson and a little isolated. Almost everything we did in Branson took us about 25-30 minutes one direction. We camped at Branson Jellystone Park in a Travel Trailer. We visit this campground 1 - 2 times a year. We usually stay here when we visit Branson or when we trout fish the White river or Lake Taneycomo. It's about 14 miles outside Branson. This campground is top notch. The owner and his wife are probably the best campground hosts we've ever met. The campground is obviously geared for children, being a Yogi Bear campground. The bouncy pillow, pool, gem mining, Yogi visits and the themed weekends are just awesome. But don't let that fool you. This is a great place to stay even if you don't have children. Its quiet, well maintained, fresh coffee at the store every morning. The laundry room is neat, everything works, (which is not always the case of other laundry rooms in campgrounds) and the camp store is great. We camped at Branson Jellystone Park in a Fifth Wheel. Located close enough to Branson, but the sites are not cramped together, like in Branson. Good place to stay if you're planning a trout fishing trip. Just awesome family get away: so many things for the kids to do. We loved our stay at this pretty, peaceful campground just 15-20 minutes outside of Branson. The owner goes out of his way to make sure you're comfortable and allows you to check out the available sites before choosing one. The grounds are very nicely cared for. The playground and bouncing pillow are awesome! The park is very quiet this time of year and the pool doesn't open until the middle of May. All the "extra" park activities (like Yogi visits) start up when the summer season begins, but they put a movie on just for us in the theater! You can get firewood as well as lots of other items in the well stocked camp store. The redbuds and the princess tree blooming outside our RV are an added bonus! We have been very impressed with this park and its owner & caretaker and look forward to staying here again when we return to Branson, which we must, because there is just so much to do here we'll need several visits to see it all! What a fun & family friendly place! We camped at Branson Jellystone Park in a Motorhome. Be sure to check out Mountain Springs Trout Park, just off I-65 about 45 min. north of Branson, for a great rainbow trout fishing experience. Pay for only what you catch & they fillet it right there & pack it on ice for you! Delicious and so much fun! Indian Point Marina on Table Rock Lake, (near Silver Dollar City) has very reasonable boat rental rates for a fun day on the lake! We have been camping for 36 years and we feel that this park was as nice as it gets. Before setting up, the owner personally took us around to see the available sites. We didn't ask for this. He was simply trying to please and make sure we would be happy. The entire park is paved, the sites are level, comfortable, and there is a nice grassy area between sites with tables and fire rings. The whole place was well groomed and immaculate. Wi-Fi was great, The park was quiet at night. The water and cable TV were great. The owners were very helpful; particularly, about recommendations and directions for Branson. There were nice activities for young children (hayride, karaoke, bouncing house). The kiddies were sure enjoying these things. This place is about 15 minutes out of Branson, convenient, and not congested. We will return! We camped at Branson Jellystone Park in a Travel Trailer. We had so much fun at Jellystone - Branson/Forsyth the weekend before labor day. This was our first Jellystone experience and I have to say that they really set the bar high for the other Jellystone camp grounds. VERY friendly staff and Yogi, what a hoot! Our 4 yr old and 2 yr old daughters really had the time of their lives. We cannot wait to come back! Thank you for making our time there a great one!! We camped at Branson Jellystone Park in a Fifth Wheel. I love this park. We have stayed in other parks in the Branson area, but we enjoy staying at this one the most. It is neat, clean, and sites are a nice size. There are activities for kids, but still quite enough for the adults. We were there cooking with our dutch ovens along with another couple and the owners of the campground and everyone in the campground was invited to join us for the great food. Yes, it is a few miles out of Branson, but alot of campgrounds are not in the center of a tourist area. Go enjoy Branson, then go back and enjoy the peace and quite at the campground. 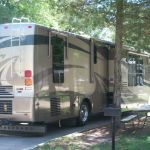 We camped at Branson Jellystone Park in a Fifth Wheel. This is an great park. Lots of activities for kids. 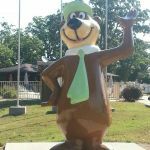 Yogi Bear makes appearances, planned activities for kids also. They have a new jump pillow that my grandkids loved. We were here on a very hot weekend and we all enjoyed the pool. Even though it is a Jellystone park, it is very quiet and relaxing for adults also. It is a few miles from Branson, but unless you want to do Branson 24/7 it is not a problem. All concrete roads and pad, clean bathrooms and excellent owners. We have stayed at several other RV parks in the Branson area and this is by far the best! Try this campground and I think you will agree. We camped at Branson Jellystone Park in a Fifth Wheel. We stayed at this campground in a furnished cottage with our grandson. He had a great time in the pool and playing minigolf. The cottage is very attractive with a good layout. This is a quiet campground that is positioned well to visit many of the attractions in the area. I highly recommend this campground to all! We camped at Branson Jellystone Park in a Campground Cabin. Spent part of Easter weekend at the park. Due to the weather and time of the year some items we couldn't use but here is what we thought. We were the only campers in the park, so some of these comments may not apply to summer crowds. We stayed in the front of the park (back seems to be mainly for long term). There is no shade, so make sure your AC is working for summer months. The sites are level but are pretty close to each other and some are short. We had to park our car elsewhere and we have a 32' trailer. The Wi-Fi worked fine at the site and the free cable included the "standard" base package. The staff was friendly but the store was closed from 11am-1pm which may change when crowds arrive. The kids (12,10,8) loved the new jumping pillow and would have used it more but the weather turned rainy. We also tried the new mining sluice and it was a hit. The bags are a little pricey at $5 but they all had around 15 gems or fossils in them. The facilities (bathhouse and showers) were spotless. Unfortunately the other activities were canceled due to the weather. We will probably come back if we can get another sale weekend. This year they were offering (3) weekends at $15 per night instead of the usual $50. I'm not sure I would be willing to pay the higher rate compared to other Yogi's. However the owners seen to be committed to adding new things. We camped at Branson Jellystone Park in a Motorhome. The rate reflects a 3 day special. If you don't love this place, just sell your rig and give up because you can't be pleased. I don't usually consider how nice the staff is when rating a campground, but when the owner is as nice and helpful as his campground is manicured it is hard not to make note of it. Concrete roads, level concrete manicured sites are spotlessly clean. We will definitely be back. We camped at Branson Jellystone Park in a Tent Trailer. This is our third time to stay in this park. We love staying here. The owners are so friendly and work hard at making your stay pleasant. This is the first time we stayed since becoming Jellystone. There were not any kids activities while we were here, but Yogi did make an appearance. I can not wait to bring my grandkids. This park is so neat clean and comfortable. Beautiful landscaping also. 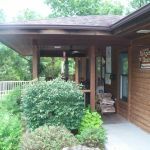 If you are looking for a quiet relaxing place close to Branson this is the place to stay. We camped at Branson Jellystone Park in a Fifth Wheel. Great customer service & facilities - very friendly managers. Note that you will want to pick the east side for your site - the west side does not have many trees at all. The pool is nice but not large. The activities for kids are on the weekend, so we missed those by staying in the middle of the week. The drive into Branson takes over 20 minutes, which was a bit more than we expected (curvy, hilly, narrow roads). Nearly all sites are concrete & level. Cable works, but a bit fuzzy on many channels for our spot. The east side of the park has some nice trees, but is not like a state park. The look is more like a very nicely done city park. We camped at Branson Jellystone Park in a Travel Trailer. Located close enough to Branson, but the sites are not cramped together, like in Branson. Good place to stay if you're planning a trout fishing trip. Just awesome family get away: so many things for the kids to do. Be sure to check out Mountain Springs Trout Park, just off I-65 about 45 min. north of Branson, for a great rainbow trout fishing experience. Pay for only what you catch & they fillet it right there & pack it on ice for you! Delicious and so much fun! Indian Point Marina on Table Rock Lake, (near Silver Dollar City) has very reasonable boat rental rates for a fun day on the lake! 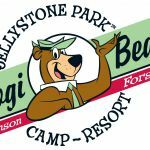 Are you affiliated with Branson Jellystone Park ?